Classic cake making methods suggest that the first step in making a butter cake involves creaming together butter and sugar. Traditionally this was done with a wooden spoon and brute strength and required the baker to endure arduous sessions of beating. With today’s electric mixers, I wanted take a look at how much mixing was enough to achieve sufficient creaming and what would happen if you creamed too far. 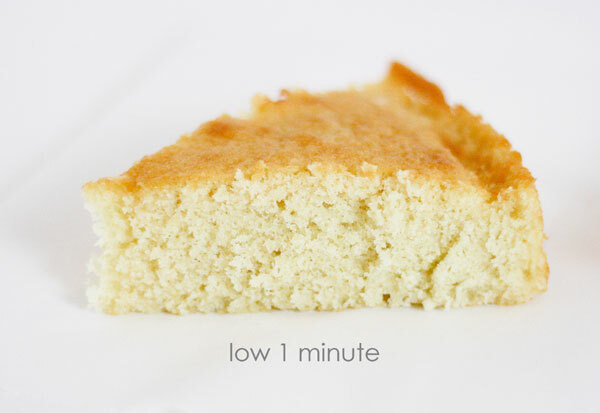 I started with a classic vanilla cake recipe and mixed the butter and sugar for either 1 minute on low, 3 minutes on medium-high or 6 minutes on medium-high. The differences in the butter-sugar combo were stark. The low-mixed combo was still very yellow in color and the sugar granules were easily detectable in this just-combined mixture. 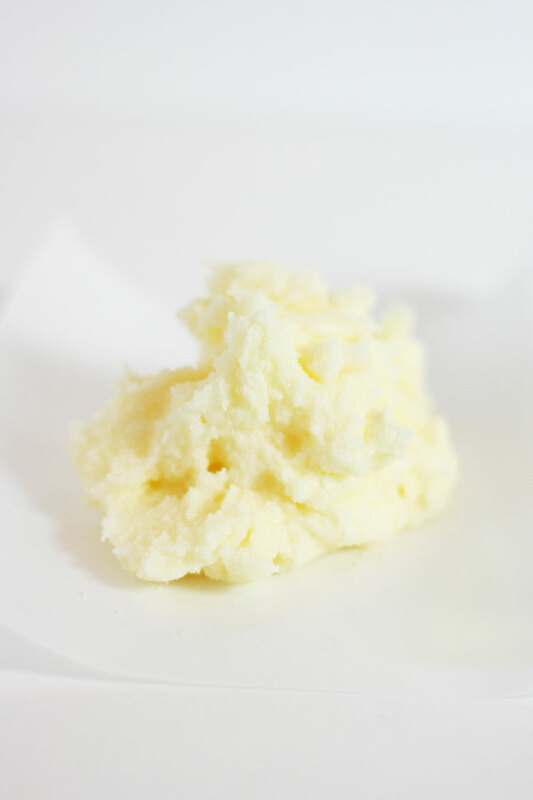 The butter mixture that was mixed for 3 minutes on medium-high was much lighter in color, less dense and the sugar granules appeared smaller or less noticeable. The combination mixed for 6 minutes on medium-high was a bit denser than the 3 minute mixing and the mixture was softer and smoother than the others. To examine why these differences occur let’s take a look at what happens in the creaming process. Butter and sugar are combined which aids in the distribution of these two ingredients. Air is driven into the butter by the beaters and the jagged shape of the sugar crystals helps to hold small air pockets as they are forced into the butter. As air is incorporated into the butter-sugar combo the light diffracting properties are altered and the mixture appears lighter in color. Friction from the mixing causes the butter to soften. Sugar crystals begin to dissolve in the liquid in the butter making them seem less pronounced. 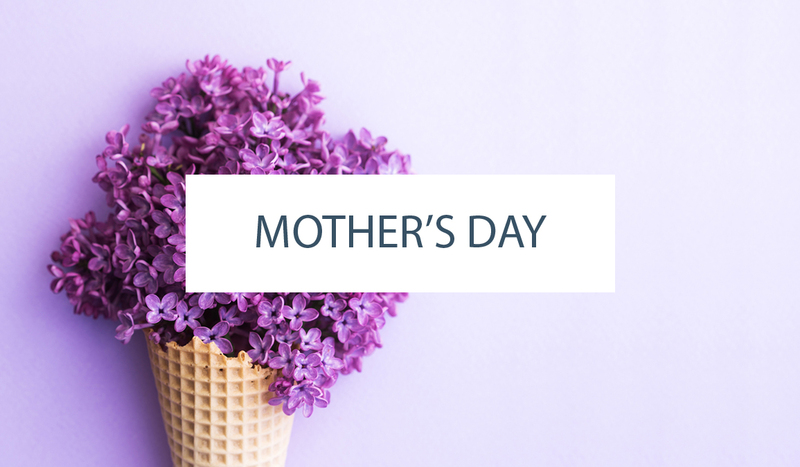 Despite marked differences in the appearance of the creamed butter-sugar combination, the differences in the baked cakes were more difficult spot. When the three cakes were lined up side by side, it was not easy to detect alterations in structure or texture. All three cakes appeared light and fluffy with an open crumb. Only mouthfeel gave away their subtle differences. The one-minute cake had a slightly more coarse texture than the other two cakes and baked slightly domed. 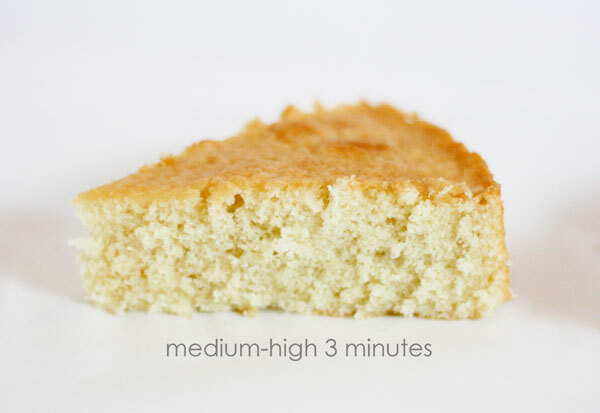 The three-minute cake had a softer, tenderer texture than the one-minute cake and baked perfectly flat. 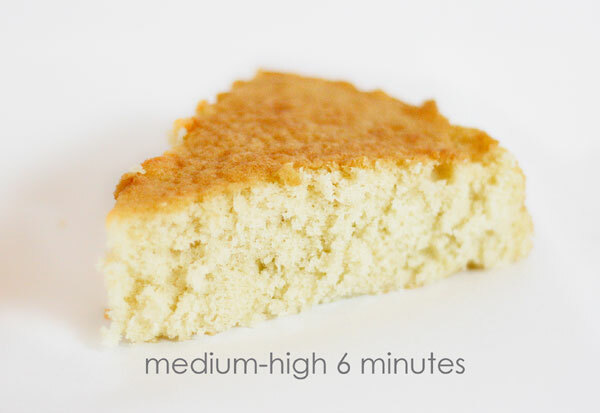 The six-minute cake was slightly coarser and just a bit cottony when compared to the three minute cake. So, it appears that you can under or over cream you butter and sugar if you are not careful. If you under mix, the sugar granules stay coarse and not enough fine air particles are incorporated into the cake batter to make it light and fluffy. 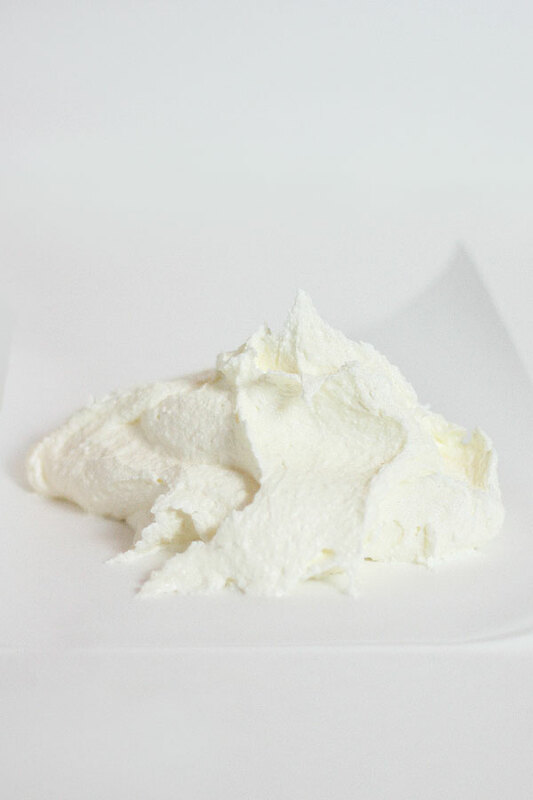 When the sugar and butter are properly creamed the mixture becomes lighter and less dense. These fine air particles expand and gently leaven the cake. The “softened” sugar also distributes better throughout the batter for a more tender cake. When the butter and sugar are over mixed the butter becomes excessively soft and the less capable of holding air pockets. The sugar also starts to dissolve making the mixture more liquid and less able to hold onto fine air cells. The resultant cake becomes coarser as the larger and less numerous air pockets converge. There you have it! Our grandmothers may have had to beat their butter and sugar for upwards of 30 minutes but a mere 3 minutes in a modern day mixer is all you need for a lovely cake! This is really great information. I often wondered if longer was better for the cake, I always kind of assumed it was… now I know better. But… how about the temp of the butter? 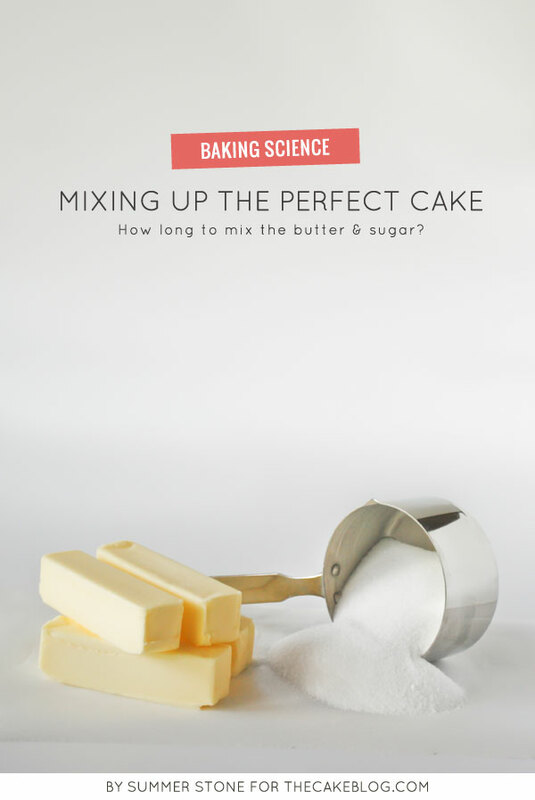 Does the temperature of the butter going into the mixer with the sugar also make a difference? I always bring my unsalted butter up to room temperature before baking (which makes for a pretty soft butter). I live in Florida.. and keep my house around 74 but with heated up ovens the kitchen temp is usually a little warmer than that. I’m just curious does the butter temp make a difference when creaming and what is the optimal butter temp to cream butter/sugar at? I’ll have to pay more attention to time when I’m mixing; I have a tendency to walk away or get wrapped up in another part of the recipe prep. So, which do you recommend? I thought the post was interesting but it didn’t really say what was recommended. Very interesting. I’ve been using reverse creaming method but find corse crumbs in my finished cake. I also found the more it beats with the eggs the fluffier the batter….. But it doesn’t dome as well such as needed for a cupcake. So now I just do enough to moisten and combine. I found the more air overall the more likely it was to collapse in the middle. Anyone else have the results? If you are seeking peaked cupcakes, bake them in a 375 degree oven instead of the standard 350 degree oven. I’ll definitely pay more attention next time when I’m mixing a cake. Great read! My mixer and I thank you. I am absolutely loving your posts. Thank you for sharing!! Thank you so much! I never know when is long enough…..now I do! I’m curios to see what difference this is going to make in my baking in the future! 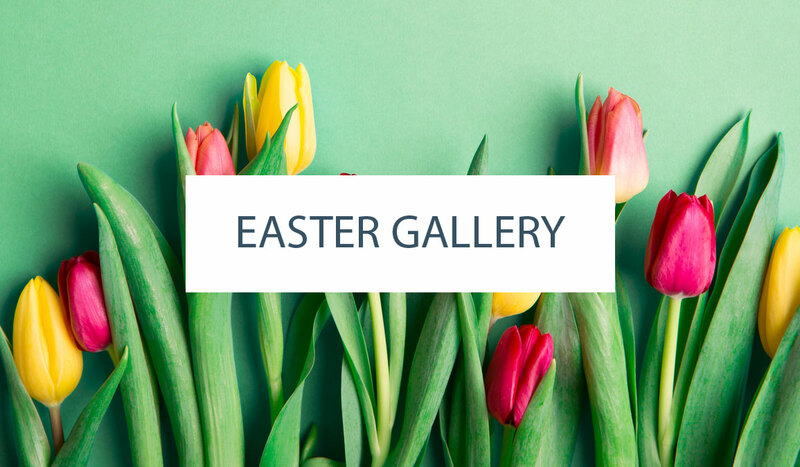 Now I’m wondering…..some recipes call for the eggs and sugar to be beaten/whisked together until light and fluffy……can you over-beat/whisk this too? How will the time it is beaten affect the outcome? Love your posts! Can’t wait for the next one! Thank you for this! 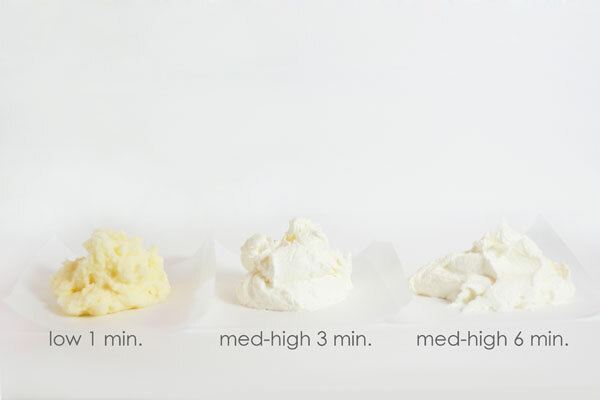 This is one of those mysterious aspects of baking that EVERYONE should be familiar with. While under and over creaming may not have been super detectable in butter cake, it can spell doom in a cookie recipe. I’ve wound up with pancake cookies from both under and over creaming, so highlighting the “perfect” cream is so useful. What a great post! Thank you so much for all your posts, they are all very informative! I tend to walk away but now I will definitely pay more attention. Thank you for taking the time to share this information it is well received and appreciated as I was so frustrated and ready to give up on my came baking exploration. God bless you for your kindness! Thank you so much for your detailed description – and so well timed! Last night I made a batch of M&M chocolate chip cookies that I have made countless times. But I decided to cream the butter and sugar together longer and I really got a different type of cookie. First of all it completely flattened out and many cookies ran into each other. The taste was different – not in a bad way but definitely different. I knew it was from the creaming time and your description really solidified that for me. Great post with interesting info. Will be more vigilant from now on. Very nice I tried the 3min with my fruit cake and the texture was good. Thank you. 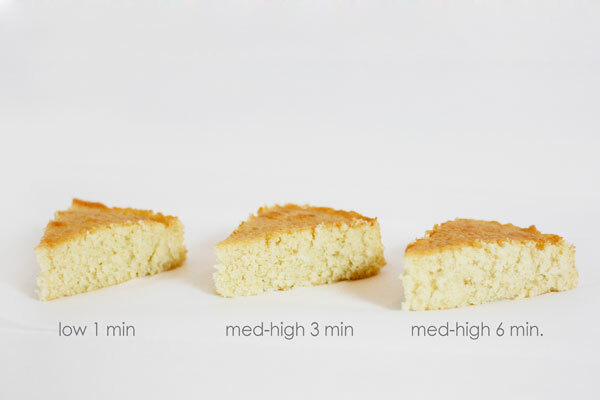 I absolutely love how you explain the science of baking. Always loved both subjects, these articles are great for bringing the two together. They have also helped me become a better baker. Please keep them coming! 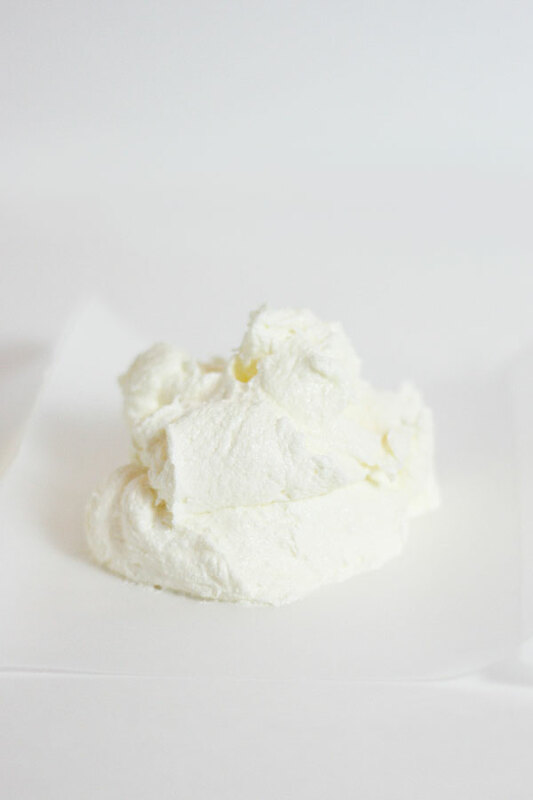 Some recipes call for creaming the butter separately and then adding the sugar and cream some more. In this case, how long would you recommend creaming each? For creaming the butter, it’s generally stated till light and fluffy. Could you skip the 2-step process and just cream them together? It’s a classic yellow cake. I made an error with my email address in the previous post so I’m just putting it into another post. Can someone help me on how much measures of butter does one cup of sugar need? I usually end up messing here which makes my cake sometimes dry or sometimes just too soggily dense. Thanks for the info, but I would like to know how much longer is it when you are using margarine . Tnx for that info.never knew that there cld be. An effect in over creaming ur sugar n butter,tot it’s only on ur batter that it shouldn’t be,will take cautions henceforth. Can I color the batter of a sponge cake without deflate the white eggs?